Three-Wave Mixing (TWM) processes appear in many fields of physics e.g. nonlinear optics, plasma physics, acoustics and hydrodynamics. In TWM, the sum of the frequencies of two waves is equal to the frequency of the third wave (ν1 + ν2 = ν3). 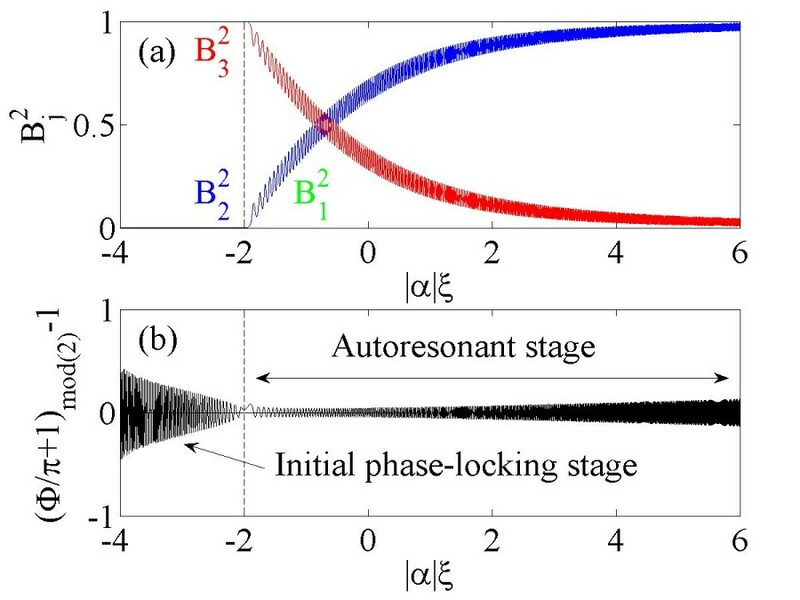 Recently, a general theory of autoresonant three-wave mixing in a nonuniform medium has been derived analytically and demonstrated numerically . It has been shown that due to the medium nonuniformity, a stable phase-locked evolution is automatically established. For a weak nonuniformity, the conversion efficiency between the interacting waves can reach almost 100% of the pump energy (see Fig. 1). Fig. 1: Autoresonant evolution of wave envelopes Bj2 (a) and phase mismatch between the waves Φ, (b) in a nonuniform second order nonlinear medium, versus normalized distance |α|ξ (from ). The power of the pump B32, signal B22 and the idler B12 are plotted by the red, blue and green curves, Note that the curves of the signal and the idler are almost overlapping. We have shown that due to mechanisms different from those previously reported, it is possible to establish an autoresonant state in wave-mixing processes, resulting in pump-depletion, also in the absence of self-phase and cross-phase modulation effects. Our work generalizes previous studies about two-wave mixing processes in spatially-varying media [2,3] and TWM in the undepleted pump regime (which is effectively a two-wave mixing process) . One of the potential applications of our theory is the design of highly-efficient χ2 Optical Parametric Amplifiers (OPAs) allowing complete pump depletion. This kind of OPAs is expected to have a very large amplification bandwidth with a flat amplification spectral profile, similarly to what have been suggested and demonstrated in the case of four-wave mixing (ν1 + ν2 = ν3 + ν4) in tapered optical fibers (see Fig. 2) . The robustness of the autoresonance effect makes it an attractive concept that has already been implemented in many fields of physics and engineering and has potential to many industrial applications. A variety of exciting new autoresonant applications in the field of nonlinear optics is currently being investigated by us. Fig. 2: Amplification spectrum of fiber OPA via four-wave mixing. Normalized powers of the signal B32 (blue line) and the pump B12(red line) are plotted versus the signal frequency f3 and wavelength λ3. a) Autoresonant tapered fiber OPA (from ). b) Usual uniform fiber OPA. The core radius is equal to the average radius of the tapered fiber of Fig. 2a. All parameters except the core radius are the same as in Fig. 2a. O. Yaakobi, L. Caspani, M. Clerici, F. Vidal and R. Morandotti, Optics Express 21, 1623 (2013). A. Barak, Y. Lamhot, L. Friedland and M. Segev, Phys. Rev. Lett. 103, 123901 (2009). S. Richard, J. Opt. Soc. Am. B 27, 1504 (2010). H. Suchowski, D. Oron, A. Arie and Y. Silberberg, Phys. Rev. A 78, 063821 (2008). O. Yaakobi and L. Friedland, Phys. Rev. A 82, 023820 (2010).